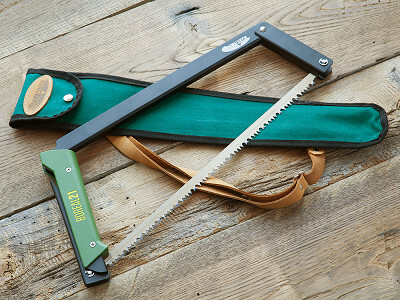 The Boreal21 Bow Saw has a smart, portable design: it folds down flat. In its folded state, the blade is completely protected—it can’t catch on things or cut you. 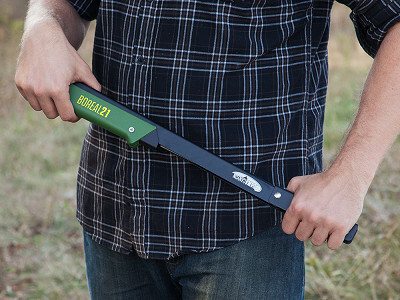 That makes carrying and storing the Boreal21 easier and safer than traditional saws. It also makes the blade less likely to rust. To start sawing, unfold the handle, pull and rotate the pivot bar, and connect it. To close it up again, just reverse the process. Even though it’s collapsible, the Boreal21 is capable. The durable, Swedish steel blade can handle tasks big and small. The grip is made with weather-resistant, fiberglass-enforced nylon. We found it was easy to hold even after we had been working for a while. 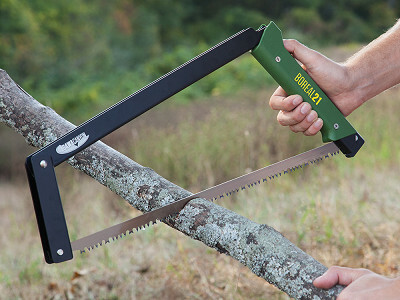 Use this folding saw while camping or kayaking, to cut down your Christmas tree, or just to tidy up the yard. When you’re done, fold it up and it’s ready and waiting for the next job. Hello everyone! I'm proud to introduce The Grommet to the Boreal21 Bow Saw from Agawa Canyon. I'd be happy to answer any questions you have! A foldable Bow Saw is an excellent idea! Is the blade sharpened in the regular way? The blade pattern looks unique. @Donna Thanks! This is an all purpose blade pattern with a double pointed raker pattern between sets of cutting teath. This helps to clear wood chips and fiber. It's good for cutting through any type of wood. Hi, How would this compare to a Sven Saw? Also, the Boreal21 folds down to 21.5" versus 24" for the Sven Saw. Being aluminum, will the blade hold an edge and is it replaceable? The blades are made of Swedish steel and have great sharpness and longevity. It is a 21" blade and is replaceable. @Graham 'extruded aluminum blade' from the description on this page. I read a review on Geek Dad that mentions 3 blade types. Do all three come with the saw or are they an extra? If extra can I order all three here? Hi Michael, it is indeed Swedish steel. You'll see that reflected in the details shortly. In regards to the 3 blade types, they are sold separately and for right now, you can connect with our Customer Experience team here, to get in touch with Graham and get those blades. The video clearly stated the blade is aluminum, which was shocking. I understand it was just a mistake, and will probably order one of these saws. Just pointing out that you need to redo the video, too. Thanks for all of the great products and service! @Mike Which blade comes with the saw and which blade is included in the sheath? @Michael Good to know the blade is steel, You really need to edit video or that "aluminum blade" statement will cost you a lot of sales ... I almost clicked off right there. I can't think of anything I would want an Aluminum bade for. Hi all, we are in the process of fixing everything now! Thanks for the catch. Michael, the Swedish steel blade is sold with both saws and is also the extra blade that comes with it. It's the all purpose blade. How much does the saw with blade and sheath weigh? Without sheath? Asking for purposes of ultra-light backpacking. 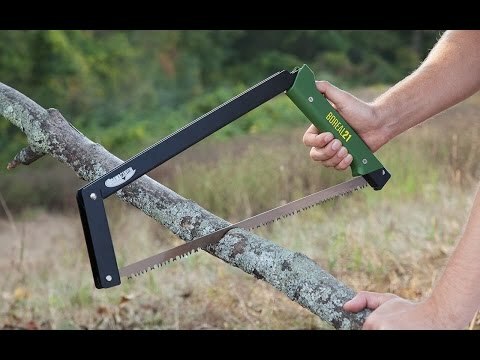 Curious about using this instead of a traditional bow saw while backpacking. What's the weight? Also want to show this to a friend who does a show on bushcraft. He might want to do a review! The video says"Aluminum, blade" elseware it says "Swedish steel" in factWHICH is it made of....for sure? 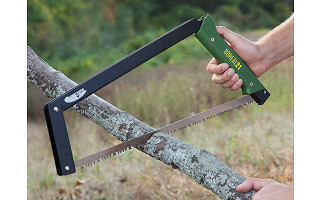 This saw looks great, how does it compare to the Bob Dustrude Folding Buck Saw? - All of the Boreal21 components are connected, meaning it's quicker to setup and take down. Plus, you don't ever have to touch the blade while opening and closing - making it safer. - The handle is smaller and more ergonomic. The lip at the bottom of the handle prevents your hand from sliding down towards the blade. - The angles on the frame allow for a more natural sawing motion, transferring more power where you want it. Do you make a bone blade for your saw. I'm sure many outdoorsman would be interested! Hi Brad, a bone saw is available. For right now, you can connect with our Customer Experience team here. They'll get you in touch with Graham about further blade options. I am a hiker and a backpacker. I go for quality gear and light weight, and this looks great. I have a similar saw, but it was WAY less money. I got it at Campmore. I was going to go with a hatchet, but thinking this would be lighter and easier to cut branches, etc. for fire wood. I like your product, I just don't get why it's so expensive. I would think $30-40, but not $65-105 plus s&h. sorry for the rant. Kind of a backhanded compliment. If your main objective is firewood then a great saw is definitely your best bet. Especially if you're looking to save on weight. 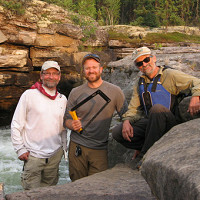 We took the Boreal21 with us on a two week canoe trip and the hatchet was never even taken out of the pack. It was the first time we didn't feel the need for it. As for pricing. I'm sure you'd be in agreement that it's worth paying extra for highest quality, function and durability. We've made no compromises in the design, production and testing of the saw and feel that the value is there. Thanks for your interest and if you decide on the Boreal21 we know you won't be disappointed! I've looked at other folding saws and had 2 concerns that kept me from purchasing them. First, does the saw have a solid construction that will stand up to abuse. I have to say that this design might meet that criteria. So, nice job on the design. My second concern was replacement blade availability. I understand the quality of the blades offered here, but if I know that I'll be doing something that would potentially damage a blade, I'd like to be able to run to the local hardware store and get some blades that I know I'll probably throw away when I'm done. So, my question is, can I get blades for this from a local hardware store? The BOREAL21 has been specifically designed and tested with top quality blades having specified hole-to-hole dimensions that produce optimal blade tensioning for enhanced wood cutting performance. Nevertheless, you can use a standard 21" blade that has dimensions similar to our blades. However, there may be slight dimensional variations between our blades and other 21" blades so we just can't guarantee that you'll always have the same cutting experience as you have with our blades. The saw is extremely solid and will hold up to lots of abuse. We have had no issues with rigidity or tension after going on many trips and doing a ton of testing. One of the first things people comment on when they pick it up is how solid it feels.